The Old Lady is back. This past weekend Juventus won the Serie A title with a match to spare and ended a long and winding road to recovery after their dramatic fall from grace. What could be seen as a flashback to the years when the Turin club dominated Italian football should rather be looked upon as a glimpse into what the future of "Calcio" could be. What Juve have done is take football in Italy to the next level, both on and off the pitch, and they should get a lot of credit for it. You could compare the club’s renaissance to that of a phoenix. When Juventus were stripped of two league titles and relegated to Serie B in 2006, their soul was dead. However, seven years later, it has been reborn and the team’s impressive achievement this season should be praised. You have probably seen the numbers from this campaign – 37 league matches undefeated, only 19 goals conceded and a goal difference of +46 which is the best in the league. However the story of Juve’s success goes beyond stats and figures. It is the story of a team that got everything right both on and off the field. 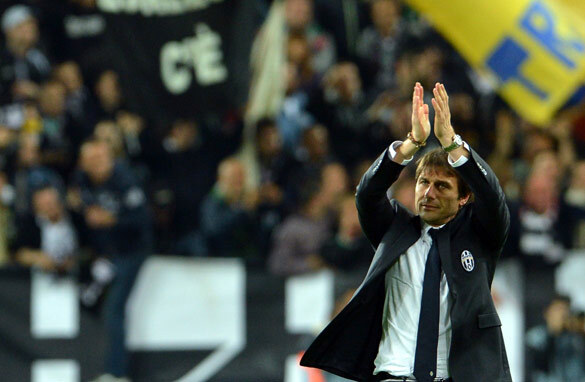 It all started with the audacious hiring of former Bianconeri idol Antonio Conte as manager a year ago. Then 41, he had led Siena back into Serie A and had a lot of promise in the style and substance of his work. After another disastrous campaign under Luigi Del Neri, a change was needed and the new board decided that Conte was the right man for the job. He was. The first thing the new boss did was build a solid backbone of tried and tested Italian players – Gigi Buffon in goal, Giorgio Chiellini marshalling defense and Andrea Pirlo pulling the strings in midfield. Slowly but surely the results started to appear early in the season, and a 2-0 win over defending champions AC Milan showed that this team meant business. As the campaign progressed, it was clear Juve were title contenders - and the fact they weren’t involved in European football gave them a definite advantage over their closest rivals. They were able to keep their best players fresh, and even though Conte failed to find a consistent goalscorer, the team kept on finding ways to win games, or at least not lose them. A key ingredient to Juventus’ success this season was the support of their home fans. You could say that about most successful sides, but this case is different. It’s just that in Italy most clubs have old and uncomfortable stadiums which have become deserted and desolate places at times. Even Milan's San Siro and Napoli's San Paolo, which get good crowds, don’t have an ideal atmosphere. Athletic tracks around the fields mean the noise level on the pitch is far from intimidating. Juve went for a different philosophy when building their new stadium. The club decided to go for a smaller, more intimate arena. The capacity of 41,000 meant it was practically always full and the stands were less than 10 meters from the touchline, meaning the atmosphere was intense. Conte admitted as much when he said the new stadium charged up the atmosphere and made playing there a huge advantage. So what should other teams learn from this? Many things, to be honest. The first is that successful clubs need to invest in infrastructure. Instead of splashing out hundreds of millions of euros on players, it does pay off to have a modern stadium where people want to go. Most of the stadiums in Italy and Spain, for example, haven’t been remodelled since both nations hosted the World Cup (in 1990 and 1982 respectively) and that is simply not good enough. They should also realize that former players with a winning mentality can have an important role to play. Conte, who won the Scudetto five times as a midfielder with Juve, was able to pass along that experience to his pupils. It was an inside job. He was given a chance, and he delivered. Last but not least, old players should be respected. Juve relied on a side which featured many players over 30 making decisive contributions. Buffon was solid, Pirlo instrumental and we should also hail Alessandro Del Piero who, at 37, still scored a handful of key goals during the season. What next for Juve? Well, the team’s next objective is winning the Coppa Italia. The Bianconeri have reached the final against Napoli on May 20 and could secure an historic double - a feat last achieved by Juve in 1995, when Conte was established as a key player in midfield. After that, bring on the Champions League. I am curious to find out just how good this team can be in the world’s top club competition. Older players won't be able to do well when competing in two different tournaments (Serie A and Champions League). While younger players are still unexperienced to play well in an Int'l tournament because of their lack of experience. Frankly AC MILAN has much better chances to do better in 2013 season. Juventus far outplayed an team in Serie A. Yes, they had a great advantage in not participating in the Cups but it would be a mistake to think that AC Milan was the better side. They had a bigger squad while Juventus had a roster of 24 players to Milan's 30 +. In any case, Juve was by far the most impressive team in Italy with it's style. If they are undefeated. AC Milan will continue to sign mediocre midfielders like they just did with Traore. They won't do anything. Hearty congratulations to Juve footballers, fans and their coach Antonio Conte. Great job from former juventus player ,Antonio Conte.Happy to see bianconeri playing champions league next seasons. Gigi Buffon,Giorgio Chiellini ,Andrea Pirlo was a great combination at the club.Hopes they continiuing this form for euro 2012.Bravo Juve. Juventus begun the season as an underdog. they played without concerns; sometimes it seemed they played for fun, and surely the crowds looked their matches for fun. next year they will begin as underdogs in Champions League. Even in Barcelona or in Munich, they will have no weight from responsibility, they will be able to play good, and maybe "for fun". a serious danger for their opponents. Congratulations to all Bianconeri fans! Hopefully Juve can bring their best game to the Champions League next season. Surely, the Champions League will be more entertaining with Juve's entry. Still, if Juve want to reach far in the CL they need to find a consistent goalscorer. Rumours about them signing Robin Van Persie are very exciting, I think he would be a good fit. No matter the name of the striker they sign, they need one who can score 20+ goals regularly per season. Without a top goalscorer they won't be able to compete with the best. Credit should be given Buffon and Del Piero in particular. Both who notwithstanding their status as World Cup Winner stayed with the during their Serie B climb-up to Serie A. Not money driven like many others. This ls a lesson for all not only footballers. Watch for 'Juv' during next season Champions League. I hope Juventus will do a great Champions League. I actually do not expect that Juve will win the Champions next year but at least it could do a nice tournament. The secret has to be to buy two or three good players (I do not agree with the purchase of Van Persie, too expensive) to complete the team list. Hail Del Piero, sad he is leaving the beautiful game. Esther, I hope you saw the interview. I tghouht it was very informative and both Beck and Donohue did a great job. They discussed why organized religion is losing so many people.